I just came across some interesting stats by Mashable on “How the Social Web Reflected on Bin Laden’s Death”. A day after the news of the killing of Osama Bin Laden broke, it’s interesting to reflect on the role social media played in the breaking and sharing of this news. Moreover, Twitter and Facebook really provided people with the perfect platform to express (and share) their feelings and opinions in relation to the death of Bin Laden. As news about Bin Laden’s death started to spread, Twitter was recording about 12.4m tweets per hour. Similarly, an “Osama Bin Laden is dead page” on Facebook generated over 442k “likes” within a day. 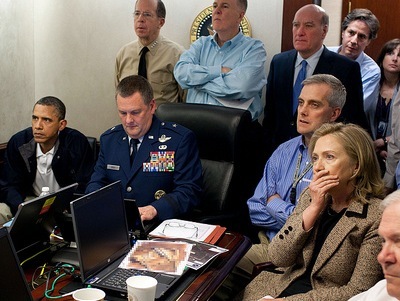 A picture of a tense looking President Obama following the secret operation saw 600k views within the hour of the photo appearing on Flickr. Finally, YouTube turned out to be an important hub for professional journalists and ordinary citizens alike, with more than 13k uploads of Bin Laden related videos within a day. Let’s not forget that the raid that killed Bin Laden was first revealed on Twitter by an IT consultant who lives in Abbottabad where the raid took place. He tweeted, amongst other things, “a helicopter hovering above Abbottabad at 1AM (is a rare event)” as well as drawing in information from other locals who were also online at that time. Main learning point: I feel that historic world events like the killing of Bin Laden really demonstrate the significance and value of social media. The speed and volume with which platforms like Twitter and Facebook enable news to spread and people to connect is really incredible. Especially the opportunity social media provides for people to express themselves and to share their opinions so rapidly and at such a scale is unparalleled. What is Sony going to do next after the major PlayStation hack?